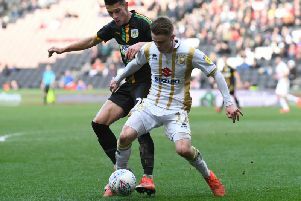 A Recoe Martin inspired comeback helped MK Dons U18s come from two goals down to beat Leyton Orient 5-2 in the Youth Alliance Merit League at Woughton-on-the-Green on Saturday morning. The forward, who came on as a half-time substitute scored a hat-trick during a five-minute spell in the final ten minutes of normal time, before capping an incredible performance with two further strikes in stoppage time. The Dons first chance came in the 15th minute of the game as the ball found its way to striker Dylan Asonganyi who rounded the Leyton Orient keeper. His effort seemed certain to nestle in the back of the net but a covering Orient player was able to block the shot at the last minute. Five minutes later the Dons threatened again as captain Charlie Pattison’s rising drive from the edge of the box was touched over the bar by the keeper. Orient took the lead slightly against the run of play just before the half hour mark as they worked the ball smartly from a goal kick and played in Brian Ifani who finished from just inside the box – 0-1. Just before the break the Dons had a double chance to restore parity, as close range efforts from Jenson Wright and Asonganyi were blocked by a combination of Leyton Orient goalkeeper and defenders. Dons’ director of academy coaching Edu Rubio made a triple change at half-time which included introducing Recoe Martin. Before the sub made his dramatic impact on proceedings, the visitors doubled their advantage two minutes into the second half when Jayden Sweeney fired home a loose ball from the edge of the area – 0-2. The Dons were becoming increasingly frustrated by missed chances and their struggle to break down Orient, although captain Pattison tested the O’s keeper on 78 minutes with an effort from the edge of the area that was parried away to safety. The game then turned on its head on 80 minutes following two penalty appeals – the first one for a perceived foul by a Dons player was not given. In the next phase of play, the Dons advanced upfield and appealed for a penalty of their own, which was given despite vociferous Orient protests. Martin did the honours and sent the keeper to the left before calmly stroking the ball low into the right hand side of the net – 1-2. Two minutes later the Dons restored parity thanks to an impressive driving run forward by Martin who then hammered the ball into the roof of the net from the edge of the area – 2-2. Martin was now running the show and completed his hat-trick in the 85th minute when he slid the ball into the net from inside the box following a good run and cross down the right hand side from Dons sub Rio Dale – 3-2. In stoppage time, Martin capped a memorable day by netting again as he lashed the ball home from the edge of the area after a smart passing move – 4-2. Martin could do no wrong and with the last kick of the game scored his fifth with a free-kick just outside the box to the right of goal. The Dons number 12 struck a beautifully curling effort into the top left hand side of the net to cap an impressive victory for the Dons and a day he will never forget – as he scored five goals in the last 17 minutes of playing time in the game. After the match, U18s manager Edu Rubio said: “In the first half we were a bit reluctant to play our game and it took us some time to get going. “We changed formation slightly due to the players we had available. I still wanted to play with a back three so I had to play a box in midfield and that did not really work because it was not a system we were familiar with. “In the second half the boys did exceptionally well. It looked like Leyton Orient would win when they scored early in the half but we managed to pull it back and it shows our self-belief and character. “The first goal was the turning point – I felt the spot kick we were awarded was a clear penalty and the earlier appeal (for a Leyton Orient penalty) was a 50-50 challenge. “I am really pleased for Recoe – he gets a bit of stick sometimes because he is not the best player tactically and not always the most disciplined – but today he has showed what he is capable of with a quite remarkable scoring sequence near the end of the game.